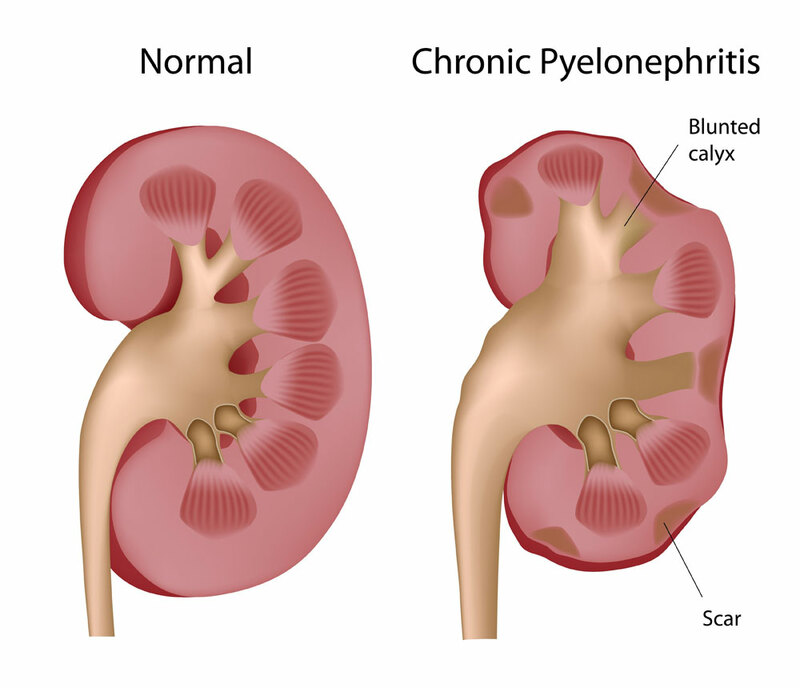 Pyelonephritis (kidney infection) is uncommon in men, largely because of the longer urethra and the fact that pyelonephritis is usually caused by a retrograde infection from below. It is much more common in women and is very common during pregnancy and in the first few weeks after pregnancy. The reasons for this are that pregnancy slows down the natural peristaltic activity of the ureters and during pregnancy in the hospital women are very likely to get a urinary catheter or have some minor instrumentation done to help in the delivery. They may need stitches after the delivery to attend to some vaginal injuries. All of this results in the introduction of bacteria into the normally sterile environment of the urinary tract. When the urethra and bladder are colonized with bacteria, the bacteria will migrate against the stream of urine (like salmon swimming against the stream of water) until they arrive in the center of the kidney. Next the bacteria invade the tissue of the kidney and will find a home where they can quietly multiply. The glomerula, which are the mini-filtration units of the kidney tissue, are relatively resistant to infection, but the tissue and the collecting ducts, which form the papillae in the renal pelvis, are not. These sensitive structures at the upper end of the ureter can easily get damaged with conditions like diabetes mellitus, kidney stones (obstruction), sickle cell anemia and poisoning with analgesics (Ref. 1, p. 1885). Often the patient gets ill very suddenly with a fever and chills. Associated with this is a flank pain on the side where the kidney is infected and the physician finds that the kidney area is very tender when tapping the region with a finger (positive percussion sign). There can also be nausea , vomiting and abdominal pain. 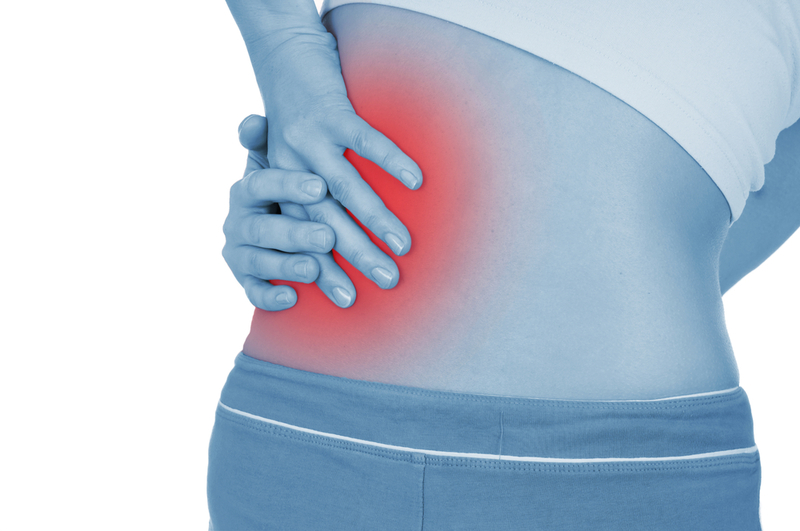 With chronic pyelonephritis symptoms are a lot more blunted or may even be absent and be replaced by a chronic lack of appetite, weight loss and general fatigue. In about 30% of cases there is also an infection of the bladder and urethra. Other than the tenderness of one or both kidneys and the signs and symptoms, there are subtle laboratory signs to indicate pyelonephritis. As the infection is centered histologically around the collecting tubules within the tissue of the kidneys, one of the most convincing lab findings is the finding of pus cells (neutrophils) in tubules in the urine or “white blood cell casts”. It means that on a microscopic level some tissue damage in one of the kidneys has been taking place. Associated with this is a positive urine culture with one of the common bacteria or more rarely one of the other pathogens (Ref. 1, p.1885). In chronic pyelonephritis it would be wise to have the physician refer the patient to a nephrologist or to a urologist. There can be anatomical malformations such as kidney cysts or back-up of urine because of a valve problem between the ureter and the bladder. Also there could be a tortuous ureter that leads to a higher incident of pyelonephritis on the affected side. There are a number of tests that can be done to gather information about the anatomical and functional situation of the urinary tract. Intravenous injection of a dye followed by X-rays gives a lot of information about the functioning of the kidney tissue and about any anatomical abnormality. Other tests such as CT scan and MRI scan can add valuable details. A voiding cystourethrogram in combination with a cystoscopy can give more details about the lower end of the urinary tract (Ref.1,p.1888). The first goal of therapy is to eradicate the pathogen that is infecting the urinary tract as the the urinary tract should be sterile. However, this may involve simultaneous other therapy such as shock wave lithotripsy for kidney stones to remove foreign bodies within the renal pelvis or ureter that only attract urinary tract infection. If there is analgesic abuse, this needs to be stopped. Closely monitoring poorly controlled diabetes will improve the chances to avoid repeat bacterial urinary tract infections and also to prevent candidiasis reinfection, in case Candida albicans was the pathogen. Congenital reflux from the bladder into the ureter can be surgically corrected by a urologist and helps greatly to prevent future infections. Cranberry juice should not be overlooked as a cheap and effective preventative therapy once the pathogens have been eradicated. It has been shown to be effective to a certain degree (Ref.1,p.1890). 1.The Merck Manual, 7th edition, by M. H. Beers et al., Whitehouse Station, N.J., 1999. Chapter 227. 2.The Merck Manual, 7th edition, by M. H. Beers et al., Whitehouse Station, N.J., 1999. Chapter 261. 3.The Merck Manual, 7th edition, by M. H. Beers et al., Whitehouse Station, N.J., 1999. Chapter 164. 4.James Chin et al., Editors: Control of Communicable Diseases Manual, 17th edition, 2000, American Public Health Association.